Malcolm Dawson writes…..with a little more luck we could have had all three points but in truth we were fortunate to come away with a draw. If that sounds more than a little contradictory there’s more to come. We hit the woodwork twice, had a goal disallowed (correctly in my view), theirs came about after an attempted pass inside took a wicked deflection off Flanagan’s outstretched leg and I thought we had the better side. But we surrendered possession far too easily, left big open spaces in midfield and at the back (which the Brewers exploited) rarely won a second ball and more than once needed Jon McLaughlin to be on top form to keep us in the game. All that and a ref who once again failed to impress. We might have had the better side but in my eyes Jack Ross’s boys only performed at about 40 per cent of their ability whilst the visitors were closer to 90. I left the ground knowing that an automatic promotion spot will be ours if we can match Barnsley’s and Portsmouth’s results over the remaining games but also a little concerned that three of our remaining six games are at home, where we might be undefeated in the league, but where we have also dropped a lot of points in games we might have expected to win. I’m writing this intro before receiving Pete Sixsmith‘s match report and wonder whether his view of the game and his assessment of our current position matches my own. Well it’s here now and you, no doubt like me, will be eager to read his thoughts. I came home last night in a bit of a quandary (it’s a smaller version of the Mazda 3) about whether this was a point gained or two points lost. It’s possible to argue for both. On the other, we came back strongly, equalised reasonably quickly and carved out chances that were either missed, hit the post or just went over the bar. We were playing a team who had beaten Barnsley on Saturday and whose last two home games are against Portsmouth and Luton Town. Kings of the division they are not, king makers they may well be. I thought they were a side that echoed Clough Senior’s rule for a good team – a strong spine. 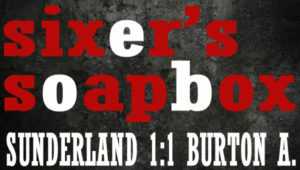 Jake Buxton was his Larry Lloyd – a big, strong central defender who has been around the leagues and who is now in his second spell as a Brewer. 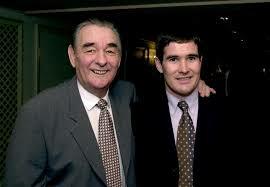 He followed Clough Junior from Burton to Derby where he played 139 times and then moved on to Wigan and back to Burton. He was physical, combative and he got the better of Charlie Wyke, although Charlie never stopped trying. In midfield, he had a John McGovern type in Jamie Allen, a former Rochdale player. Like McGovern and Paul Scholes, he was involved in everything and he was the outstanding midfield player on a pitch that at times was congested and at other times was surprisingly wide open. Finally, a big, mobile centre forward. Brian had Gary Birtles and Peter Wythe. Nigel has Liam Boyce – a player who will be known to Jack Ross after his excellent spell with Ross County in the SPL. The Northern Ireland international has a great work ethic and a degree of physicality that fits this division. Albion will do well to keep him next season and he looked a better bet than a rather limp Will Grigg last night. Albion were good opponents and we couldn’t expect them to lie down for us so that we can take our rightful place at the top of the table – although some of those sitting behind me seem to think that our opponents, whoever they may be, are not fit for the Brandon and Byshottles Sunday League Division Four. We need to be more careful and a wee bit more proactive when playing teams like Burton (and Coventry City and Fleetwood) who have little to play for but want to be an absolute bloody nuisance for those who have. The importance of Aiden McGeady was highlighted in this game due to the fact that he wasn’t there. He is the one really class act that we have at the moment and is a match winner. His absence does not make our hearts grow any fonder and the quicker he is back the better. 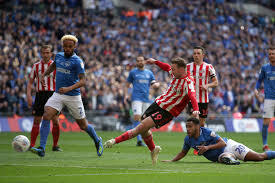 Chris Maguire, as talented as McGeady but more erratic, would also give us that bit of genuine quality that makes us better than Barnsley or Portsmouth or a rapidly improving Charlton Athletic. Some of the players looked drained in this game. Lewis Morgan, who has hardly played this season, was running on empty long before he was replaced by Benjy Kimpioka and Grigg never got into the game. 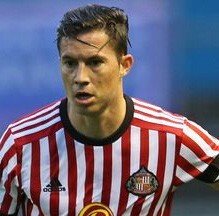 Our main attacking thrusts came down the flanks but they had O’Nien shackled in the first half and Oviedo, who I thought was excellent whenever he got the ball, was starved of it in the last half hour. We now sit in second place and still hold a game advantage over the Hatters and the Tykes with Pompey three behind on level games and the Addicks four behind and a game more played. The ball is in our hands now. Like all good rugby league players, we need to move it on quickly and get over that line with a wee bit of style. Failing that, I’d be happy to grind it out. Disappointing result? I don’t think so, given the punishing fixture list we’ve had and will continue to have this month. This is a team bearing up under extreme pressure, compounded by that brutal extra-time Checkatrade Trophy final. Let’s not forget that we’ve played 40 league games so far and only lost two of them. Even Luton can’t boast that. My worry now is not that we won’t go up – I believe we will – but that if the unthinkable happens and we don’t, Jack Ross will bear the brunt and be pushed out. That would be in keeping with Sunderland’s revolving-door policy for managers during the Ellis Short era. I would hope the new regime, which has come up trumps so far, would be more far-sighted. Ross came in lacking experience and took on a team largely comprised of largely unknown quantities and quickly moulded them into an effective force. He’s been criticized for the number of times we’ve only taken one point instead of three but I don’t think that detracts much from his overall achievement. The team is still a work in progress, as is Ross himself. But a huge amount of progress has been made and starting over with a new manager would be a badly retrograde step. This is, of course, all academic. We have a wicked schedule going into May but Ross’s squad have proved themselves to be fighters, not quitters. We can… we WILL pull this off. Ha’way the Lads! As I was saying before a massive French thunderbolt cut off my power, Bill is right. And so are Malcolm and Pete, based on my access to the game, which was via Barnes and Benno, earphone in mobile as my wife watched Luther on Netflix. I winced at how often Burton names – Allen, Boyce, Harness, Quinn et al – seemed to be in possession. And yet we – ie Wyke – had those great chances to seal three points. Whatever happens, good or bad, I’m going to be thankful for the most entertaining season we’ve had in a long time. The disappointment comes from the fact that prior to kick off we knew how valuable the three points would be and the hope that after two away wins we could make it four league wins on the trot. Also from the fact that on two occasions we hit the woodwork and it was only a matter of inches that prevented us from getting maximum points. Further disappointment from the fact we conceded possession needlessly on a number of occasions. McGeouch has been great in the past few games but it was a heavy touch that lost him the ball which then led to their goal. Disappointment that our defence was breached so easily although Flanagan tried hard to recover, more disappointment because it was a wicked deflection that beat McLaughlin. It was a cross not a shot. Lots to be disappointed about though not the effort or commitment of the team, nor the fact that promotion is in once again in their hands. While the home crowd are not really displaying any negativity there can be more frustration than in away games where the crowd is 100% behind the team the whole time. What effect that has on the players is probably negligible but it is noticeable. Saturday is another opportunity but will be another tough game. Four games in 10 days was bound to take a toll. We could have won it but sloppy play in the last few minutes meant we could have lost it. Poor referee yet again and although he wasn’t directly involved in our drawing his decision making was highly suspect.I rate him as fourth worst at home this season behind Coote (Peterboro’), Probert (Luton), and Heywood (Oxford). Mr Coote by the way reffed in the Premier last week-end.